This beautiful wishbone inspired 14ct white gold wedding ring is adorned with expertly crafted 0.10ct diamonds. Timeless, elegant, and featuring an intricate ‘Ever Us' engraving on the inside of the band, this piece is the ideal accompaniment to your engagement ring. 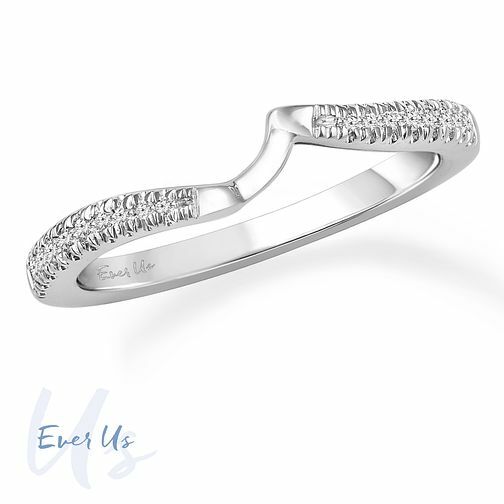 Ever Us 14ct White Gold 0.10ct Diamond Shaped Band is rated 5.0 out of 5 by 1. Rated 5 out of 5 by Anonymous from VEry happy Came very quickly and looks beautiful with its matching ring. Very happy with it.